A Tri City Elementary third-grader plants seeds in the riparian area of Alder Community Creek Forest in hopes of seeing new maples and oaks sprout in the spring. 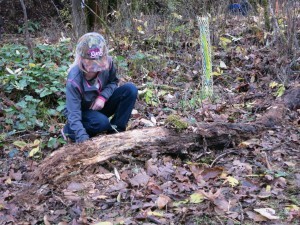 Walk into the Alder Creek Community Forest on a school day, and a lot can be happening beyond the next fir. Myrtle Creek third-graders sift through samples of clay, sand and loam as they learn about worm habitat. Special education students from Riddle track weather patterns as part of a lesson in atmospheric science. Tri City youngsters skim the forest ground collecting seeds, leaves and rocks for a pre-kindergarten art project. 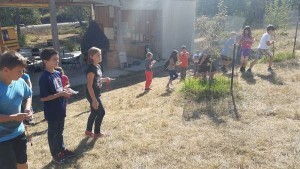 These kids are among hundreds of South Umpqua School District students taking part in a K-12 curriculum launched this summer at the forestland west of Canyonville. The program is called Our Place on Earth, and it’s funded through a Gray Family Foundation Geography grant. Whether students are making molds of wildlife paw prints or charting a tree’s changes through the seasons, they are absorbing lessons that might be missed in schools where science instruction is limited. It all takes place at the 78-acre site with a mission of “offer(ing) a safe place for exploring the outdoors, and for lifelong learning and dialogue to address challenges in sustaining forests, watersheds, and communities,” according to the Alder Creek Community Forest website. The land was once owned by Robert and Virginia Proctor of Canyonville, a couple committed to serving the region’s educational and community needs. After their deaths, the Alder Creek Children’s Forest gained nonprofit status in 2002 and began securing grants to develop educational programs on the site. The organization was renamed in 2010. 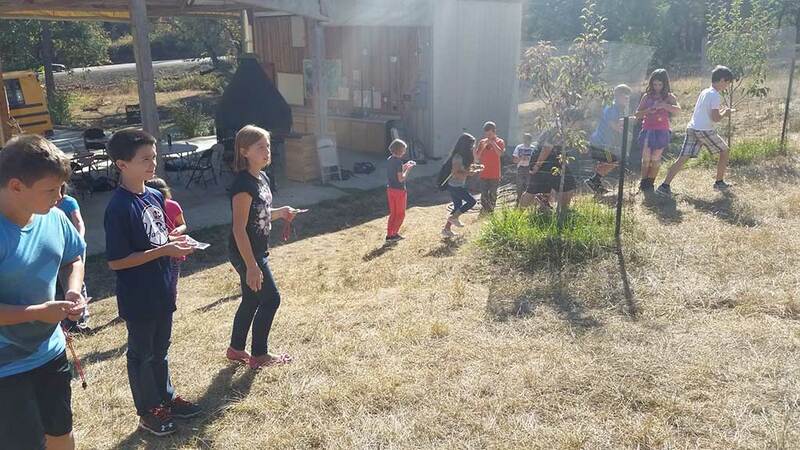 Fifth-graders from Tri City Elementary learn survival skills as they practice reading maps and consulting compasses. The Our Place on Earth program came about through the Gray Foundation grant emphasizing the field of geography, according to Jim Proctor, son Robert and Virginia. Proctor has a twofold interest in how studies are conducted at Alder Creek. Besides his family connection, Proctor is committed to outdoors education in his role as professor and director of the Environmental Studies Program at Lewis & Clark College in Portland. Proctor’s enthusiasm for the Our Place on Earth curriculum is heightened by its links to GLOBE, an international, collaborative K-12 outdoor science program that correlates with U.S. Next Generation Science Standards. Our Place on Earth also ties in with the Gray Family Foundation’s emphasis on geography – a field of study that goes far beyond the traditional sense of the word, as Proctor explained. Proctor said it was important that Our Place on Earth be offered to SUSD teachers as a service, and not as one more imperative on their already teeming to-do lists. That’s where school coordinators Jessica Pires and Rich Dilbeck play vital roles. A forestry guide and retired science teacher, respectively, it’s their job to talk to the district’s teachers about how Our Place on Earth curriculum can underscore or complement classroom lessons. Students then get clear directions when they arrive at the forest. From mid-September through Thanksgiving, the Alder Creek site hosted 15 different classes, most of them in the second through fifth grades. That represented more than 650 students, totaling around 2,000 hours of field-based learning. Some students returned multiple times. In many cases, Pires and Dilbeck must first teach students some basic skills. They may introduce students to compasses, barometric pressure, cloud types and soil surfaces. But even the youngest children with the shortest attention spans can find something about their Alder Creek visits that ignites their enthusiasm, according to Pires. She’s hopeful that at least a few may go on to pursue careers in the natural resources field. But if nothing else, she’s convinced Our Place On Earth has introduced students to the concept of how people affect the land. Proctor agrees that something special happens when students take part in hands-on learning in “a world they share with bears and bobcats.” He’d like to see Our Place on Earth funded for another year and perhaps expanded into other Douglas County school districts. He said he’s also appreciative for the financial and in-kind support SUSD has provided to make the experience possible. “I guess what excites me most is seeing how excited young people can be about learning,” he said. “They are taking measurements, storing and mapping data and looking at patterns just as a professional would work.